The hull and interiors of this little ship, Metsuyan IV, are the work respectively of Ginton Naval Architects and Ken Freivokh Design: another new vessel presented at the Genoa Boat show in a superyacht context. 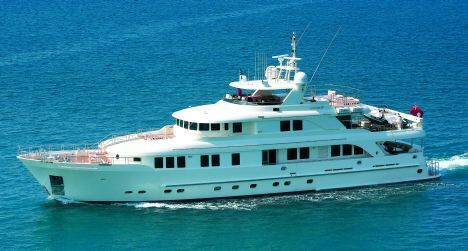 Recently launched by CBI Navi, it is particularly important in the history of this Viareggio yard because it is the first vessel completed since the brand name and yard were purchased by Fipa, the Group headed by Francesco Guidetti. 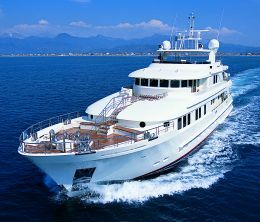 range at cruising speed 3.500 n.m.
construction materials: steel hull, aluminium superstructure. 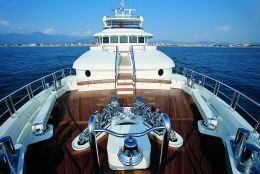 So the Fipa Group has stepped into a sector previously unknown to it, at least as far as its pleasure craft production is concerned: construction in metal and displacement hulls, after having achieved success with rigorously custom vessels in composite, the Maiora range of motoryachts and the AB Yachts opens. 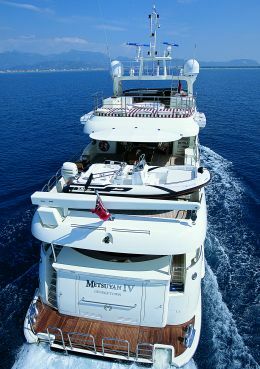 Metsuyan IV is a little ship with steel hull and aluminium superstructure, developed on three decks plus a large size sundeck, extended aft by a full beam sunbathing area with a circular Jacuzzi. The "sun- loving" aspect of the exteriors is highlighted by the great emphasis placed on the bridge deck below, precisely with regard to its external part which focuses on a vast terrace on the sea that stretches fully aft, but also has another sunbathing area forward, well connected with the main deck below. In side view the boat presents not too high but very protective bulwarks that meet in a soaring, thrusting bow. We met engineer Ginton during our visit and he told us that he had designed an ocean-going vessel that was structured and fitted out to tackle demanding sailing and long cruises, based on a displacement hull with a bow bulb that reduces friction and therefore consumption by 7%. The idea was to obtain the best compromise between seaworthiness, stability - helped by the Quantum Zero Speed stabilisation system - and very long range. The main data Ginton supplied on this subject are as follows: the vessel can make up to 2.700 miles at the maximum speed of 12.5 knots; at cruising speed of 10 knots the range increases to 3.500 miles; and with the engines at minimum speed this figure becomes 11.000 nautical miles. All thanks to the thrust of two MTU 8V2000 M60 engines of 536 HP at 1.800 rpm, and to a fuel capacity of 45.000 litres. Ginton added that the construction system is very simple, which greatly facilitates any hull repairs. On a hypothetical round the world trip the vessel could be attended to by not so well equipped yards, though she is over-dimensioned in all parts of the hull and systems, far beyond Lloyds and MCA standards. Ken Freivokh, who took us round the interiors of Metsuyan IV, told us that obviously he'd designed the boat as the owner wanted it, with great emphasis on spaciousness and on board liveability, which in Freivokh's opinion is comparable to that of a 42 metre vessel. The two designers - the Dutchman Ginton and the Californian Freivokh - worked very closely to achieve the highest level of comfort, adopting solutions that drastically reduced engine vibration and sound diffusion. The noise levels are decidedly far below the norm. The idea of a solid ocean-going vessel which is expressed by Metsuyan IV's exterior, comfortable and welcoming, is confirmed by the interiors, by atmospheres that are rich and warm but never so overabundant as to take away an elegance that strikes the eye. 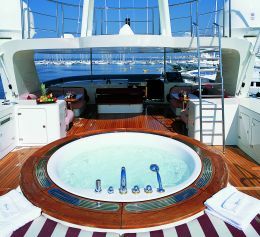 The leitmotif of the yacht is the refined woodwork. 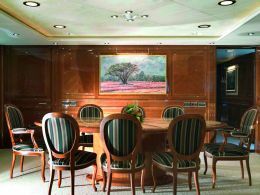 Predominantly dark woods personalise every environment, alternated with the light- coloured nuances of the upholstery and hangings which give further brightness to spaces that are already well illuminated both naturally by the large windows and artificially with the possibility of creating suffused atmospheres that render the boat even warmer. 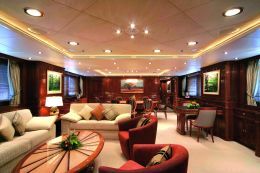 The entire lower deck is taken up by the guests' night area, with four distinct cabins. 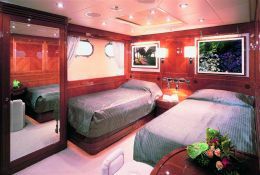 On the starboard side, two twin bed cabins and on the port side a more spacious VIP cabin - with a huge bathroom including shower unit and Jacuzzi - and a cabin with double bed. They all have private bathrooms and look onto a shared landing from which stairways lead to the foyer amidships on the main deck. 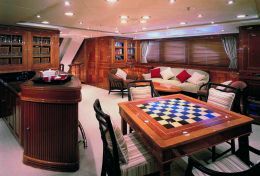 The fairly spacious foyer, which also has a handy daytime bathroom, is therefore a sort of nerve centre that puts the various decks in communication, not to mention the most commonly used areas of the yacht. But it also links indoor and outdoor. Going aft there's a vast saloon subdivided into a dining area with an elliptical table seating ten, and a conversation area farther aft with sofas and armchairs. 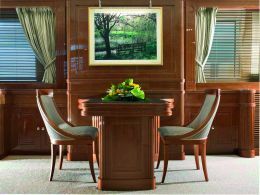 Externally protected by the bridge deck, and therefore always ready for use, there's a second very spacious area for lunch or dinner: a large sofa abutting the transom and an oval table with chairs. From the foyer you can also access the crew's quarters by way of stairs leading forward on the lower deck. 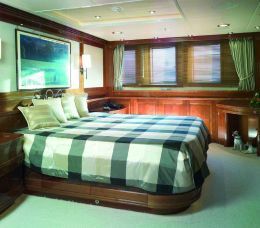 The crew area includes two cabins with bunk beds, the captain's cabin with double bed, and a service galley and dinette. 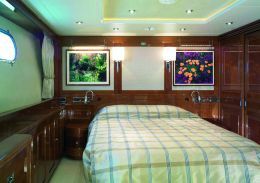 A corridor leads to the main galley, in steel and with every imaginable accessory, including central islands for fixing quick snacks, and to the practically professional laundry. Again from the foyer you access the owner's area with his suite preceded by a private office with walk-in wardrobe and full beam bathroom. From the foyer, lastly, you access the bridge deck where the whole forward part is occupied by the command station, with a central steering position excellently backed up by technology for complete handling and continuous monitoring of the vessel. Behind the command station there's a dinette on the port side for those who don't want to miss the spectacle of getting under way. Farther aft is the captain's office with another bathroom on the starboard side. 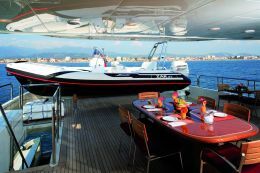 The aft portion of the deck is indubitably the panoramic zone of the vessel, favoured by huge glazed areas overlooking the terrace referred to previously and equipped with an outdoor, extremely private dining area with a table seating ten. The main thing expressed by this deck is conviviality, with the closed portion perfectly connected to the outside - its natural extension - and featuring a small saloon that can also become a TV area or a bar for the parties that the surroundings seem to suggest. "Working with CBI Navi was really a great experience," Freivokh told us, "because it's a name that fully expresses the great Italian and above all Viareggio tradition which is specialised in exemplary finishes and the greatest craftsmanship."